This year’s Next Wave Festival marks the arrival of a new experiment. The Brooklyn-Paris Exchange is the creative brainchild of BAM Executive Producer Joseph V. Melillo and Théâtre de la Ville director Emmanuel Demarcy-Mota. The conceit is simple: four companies or artists, chosen by Melillo and Demarcy-Mota, make their respective Paris or Brooklyn debuts as part of the other institution’s season. Melillo’s selections—the explosive Zimbabwe-born choreographer Nora Chipaumire and innovative theater troupe The Civilians—embody the breadth of the borough’s current creative output. Demarcy-Mota’s selections are similarly expansive, bringing celebrated circus artist Yoann Bourgeois and the hip-hop-inflected movement of dance duo Wang Ramirez to Brooklyn for their Next Wave debuts. The exchange was born organically out of conversations Melillo and Demarcy-Mota had when their globe-trotting itineraries aligned. Demarcy-Mota has been to BAM with Théâtre de la Ville for galvanizing productions of Ionesco’s Rhinoceros and Pirandello’s Six Characters in Search of an Author; Melillo travels frequently to Paris and has showcased many French productions throughout his three-decade tenure as BAM’s programmatic steward. Together they celebrate the many similarities between these two great cities, witnessing firsthand the creative energy and output emanating from both. And despite the great responsibility of their “day jobs,” both men are, at heart, artistic explorers, seeking out work that surprises and upends preconceptions of genre, content, and form. 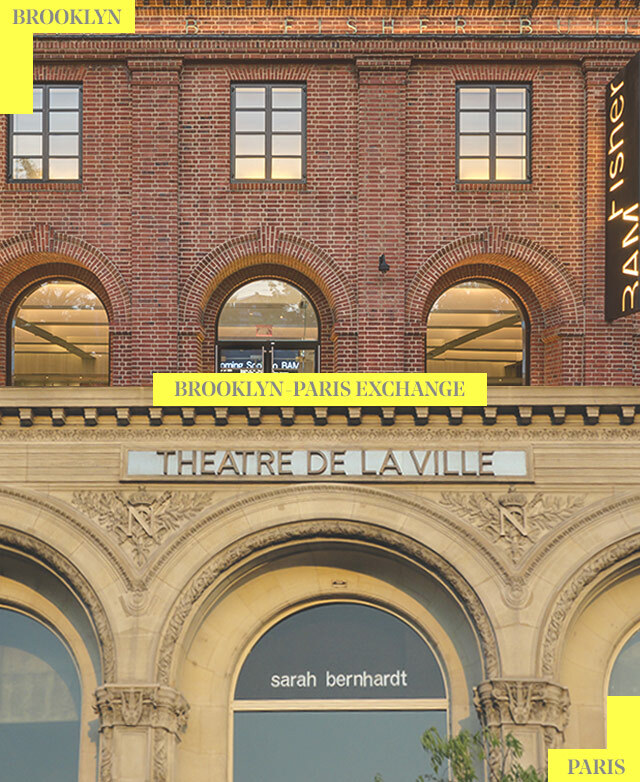 They are further connected by a shared belief in the importance of each institution’s smaller, more flexible spaces—the BAM Fisher here in Brooklyn, Théâtre de la Ville’s Théâtre des Abbesses (plus its other intimate venues throughout Paris)—as integral to an overall mission of cultivating and showcasing artistic innovation. In the end, this new exchange is about trust. Melillo and Demarcy-Mota are, in essence, giving one another carte blanche to program a section of their corresponding artistic seasons, while also placing trust in the artists, and audiences, that the work will transcend cultural barriers.